It is long time ago that something changed on our page. The previous design is aged and not up to date. At the same time as the release of our new album our website now gets a new face. .A small tour shall help you to get along with the new page. Via the Doomshine logo you get to the landing page. The landing page provides a quick overview of the contents of the page. 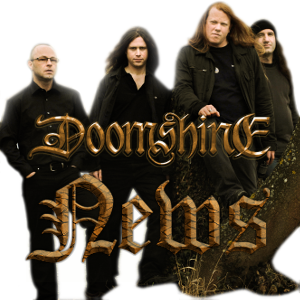 Here there are the band’s biography, discography, posts about each band member with email address and the contact page with the band’s email address. Here all past and coming gigs are listed. With a click on the title of a gig you will get to the appropriate post of the gig. Here you can post your feedback about the website, the album or anything else. Here there are posts about each album, the single, picture galleries, videos and promo material. Here all news posts are listed. You are reading one of them at the moment. If there are any news from the Doomshine camp it will find its way to a post at this place. Top left you will find the link to login. Here you can login if you are already registered or you follow the link to registration. If you are logged in youre login name will be displayed top left. With a click on your name you will get to the configuration page of your Doomshine account. Here you can for example upload an image that will be displayed in your posts in our guestbook. Top right there are some icons. With a click on the country icon the language can be switched between german and english. The three further icons lead you to the Doomshine accounts on Facebook, Twitter and Youtube which Carsten is taking care of. Also new are our bonus contents. The registration for it is only accessible via the landing page. Just follow the white rabbit … Saw Matrix, or? Enjoy browsing our new site.